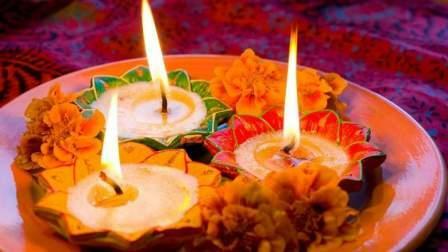 Just one more day to go for Diwali! By now, all preparations would have been done -- the lights, diyas, sweets, decorations -- would be in place. Diwali is a time for celebration, family and fun, and Dubai will come alive throughout the month with activity curated especially for India's biggest festival. From gold and jewellery promotions to musical performances by some of the biggest Indian artists and photography tours that aim to capture the festivities, there is something for everyone to enjoy. Bollywood Parks at Dubai Parks and Resorts will be buzzing for a whole month from October 5 to November 5 with an array of activities to delight visitors this Diwali. Head down with the family to experience bright and colourful decorations all around the park, a market selling Diwali-themed snacks and delicacies, special dance performances and intricate rangoli art displays. During the 19-21 October, a special daily fireworks show will light up the sky behind the Rajmahal Theatre. To culminate the festivities, celebrate a fun 'Diwali Dhamaka' day out on the October 20, where the centre of attraction is none other than Mika Singh, popular Bollywood and Punjabi singer. Opening the concert will be ROOH with an after party at Rock On. You'll also get to enjoy a fireworks show and the rides and attractions at Bollywood Parks Dubai. Revel in the colours of India at BurJuman this Diwali from 12 - 21 October. Kick off the festivities with City 101.6 RJs, Malavika, Sid and Meghana from 5-7pm on 13 October, who will get you into the celebratory mood with an afternoon filled with fun games and exciting prizes. From 15 - 21 October, both kids and adults can enjoy beautiful pottery art in a traditional themed tent and try henna painting as well as arts and crafts from 4-10pm, while on 19, 20 and 21 October, the mall will come alive from 6-8pm with the beats of traditional and modern Indian dance performers. On 13 October, from 8-10pm, the renowned Sufi singers the Wadali Brothers will perform live at DUCTAC, Mall of the Emirates for the first time in Dubai and for one night only, exclusively through Emirates NBD Classics. This humble yet highly talented duo is as inspirational as the songs they sing, having won awards for their powerful renditions and written verses. Aimed at children over the age of ten. From 13 - 22 October (3-9pm daily), enjoy mesmerising entertainment and experiences that include henna artists, kids' workshops, a rangoli artist and roaming entertainment. And if that wasn't enough to get you there - you also have the chance to win 10g of gold daily! From 6pm - 1am on 27 October, the Desi Fiesta will explode at the Media City Amphitheatre with a powerful live concert from headline act, Armaan Malik. Malik is one of Bollywood's shining stars, with hits including Main Hoon Hero Tera from the movie Hero, and Kehta Hai Pal Pal, Aaja Na Ferrari Mein and Besabriyaan from Ms. Dhoni. Other musicians entertaining at the fiesta include Momina Mustehsan, Shahnah Kholgade and Neha Dhupia and food trucks will be on hand to appease appetites throughout the evening. Dinner and dancing - the perfect recipe for a fun-filled desi evening! Every hour starting at 7pm (till closing) from 18 - 22 October, Dubai Festival City Mall will be celebrating the Festival of Lights every evening with a special projection during the IMAGINE Show on Festival Bay. Dine with your friends and family at one of the many restaurants on Festival Bay and capture a picture of the world's largest permanent projection mapping screen as it sparkles with vibrant lights and colours this Diwali. Budding photographers - look no further than this captivating tour of Bur Dubai on 19 October, organised by photography centre, Gulf Photo Plus and the food experts from Frying Pan Adventures. For this one-night-only event to mark Diwali, you'll be led through the streets of Bur Dubai, watching the neighbourhood come to life with a kaleidoscope of colours as night falls. Along the way, you'll be taught how best to capture the sights with your camera, as well as being treated to some of the best dishes that Bur Dubai has to offer, including chicken tikka and Indian sweets. Masood Boomgaard, renowned South African stand-up comedian will be heading to Dubai this Diwali to perform "African Indian", packing out the Junction Dubai, Al Serkal Avenue over two shows on the 21 October (4.30pm and 7.30pm). One of the brightest stars in South African comedy, Masood will show off his witty take on a range of topics from technology and sports to relationships, celebrities, parenting and everything else in between. "African Indian" has something for everyone and offers a combination of rapid fire one liners and more elaborate story-styled jokes. Boomgaard is celebrating his tenth year in comedy this year; "It's a milestone for me and I plan to give Dubai the very best of me. On 27 October, Burj Park will be taken over by the audio launch of the much-awaited 2.0, Indian superstar, Rajinikanth's latest film, directed by Shankar and with music composed by the world famous Indian composer, A.R. Rahman. This not-to-be-missed event will feature a live performance by A.R. Rahman in the presence of Rajinikanth, co-star and Bollywood A-lister, Akshay Kumar and others. With the stunning Burj Khalifa in the backdrop, Burj Park is gearing up to host one of the most highly anticipated events of the year in anticipation of one of the biggest Indian blockbusters in history. Don't miss out! On 27 October from 8pm - 2am, Ali Zafar and Ayushmann Khurrana will come together to perform live on stage at the MTV India Unplugged concert at Dubai Duty Free Tennis Stadium. Famous for starring in television shows and films and also being singers, they'll be belting out some of their biggest hits. Zafar is a singer-songwriter and has also worked as a composer - his first big hit was Channo and his songs have also appeared on Bollywood film soundtracks like Karachi Se Lahore. Khurrana is best known for his singles like Pani Da Rang and O Heeriye. Don't miss these super stars while they're in town! Tickets cost from Dh49 to Dh649. Reef Mall will host pottery decoration activities for adults and children between 4-10pm from 13 - 21 October. Check out an array of shopping outlets as well as the largest Fun City in the UAE! Multi-cuisine dining at the food court and trendy cafes offer great little spots for a quick meal in the midst of browsing your favourite stores.